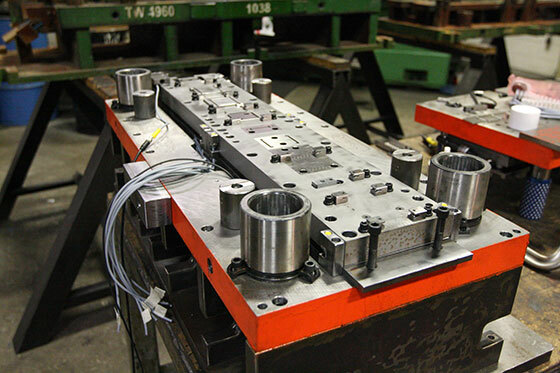 At Waukesha® Metal Products we take pride in our ability to provide complete solutions for complicated metal stamping projects through the use of progressive dies. Progressive stamping can be advantageous for any industry that has a consistent need for complex parts. One of the most notable and consistent users of progressive dies is the automotive industry, which frequently requires smaller, more complicated parts. Of course, we’re always on the lookout for projects from any of the industries we serve that would could be made more efficient through progressive stamping. The biggest benefit of progressive die stamping is the ability to create more intricate parts while maintaining high tolerances. This type of stamping also requires less set-up and production time. Rather than setting up multiple presses for different stages of a production, we can set up one press and let it do most, if not all, of the work. This increases productivity and lowers costs for our customers. Progressive dies also allow for more precision than a transfer press. As the part moves to each station, the press ensures the metal is properly aligned through pilots, which secure the part through pre-punched holes. These pilots allow for precision within a few thousandths of an inch. The process is also highly repeatable for longer periods of time, making it ideal for longer production runs with higher volume projects. Every design has its own unique set-up needs, including, usually, custom dies. At Waukesha® Metal Products, we have an in-house tool and die room with years of experience with creating custom progressive dies. In concert with our design and engineering team, our tooling experts can work together with your engineering department to set up a progressive die process that will deliver your part to exacting specifications. Interested in Progressive Die Stamping? Use Our Form To Contact Us!